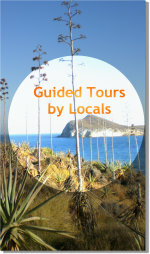 Self-guided Tours by Car, Walks, Hikes, Cycling, ... it's up to YOU! Note: that while some spots can be reached by car (although on a dirt path), others can only be reached by bike or on foot. Please download the corresponding brochures for detailed information. This is one of the Cabo de Gata tours that takes you to the film sets seen in "The Rat Patrol" (1966), "The Good, The Bad and the Ugly" (1966), "Johnny Yuma" (1966), "The Executioner" (1969), "A Fistful of Dollars" (1964), "Gunmen of Río Grande" (1964), "Day of Anger" (1967), "Gringo Spara" (1968), "Una pistola para Ringo" (1965), "Yo soy la Revolución" (1966), Tepepa (1969) or some chapters of the series Curro Jiménez (1977),"The Wind and The Lion" (1975), "The Adventures of Baron Münchausen" (1988), "Indiana Jones and The Last Crusade" (1989), "Las cosas del querer" (1989,"The Man who Lost his Shadow" (1989),"Yo soy la revolución" (1969), "Tiempo de buitres" (1967), "Los Cuatro Tuhanes" (1968) or "Agáchate maldito" (1971). 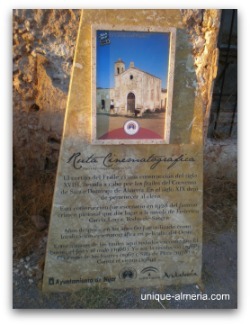 You will also visit the REAL crime scene of Federico García Lorca's "Blood Weeding"! This tour introduces you to the virgin volcanic beaches, it's fauna and flora and it will take you to: "La Granatilla", "Cortijo el Nazareno", "La Boca de los Frailes", "San José", "Los Genoveses’ Beach", "Mónsul Beach", "Los Escullos", "La Isleta del Moro", "Rodalquilar" (House of the Volcanoes). There is a viewpoint in Isleta del Moro, where you will get a fantastic overview of the entire volcanic coastline!